Simplify3D is a professional software for 3D printing. Unfortunately, the program does not include a PC auto shutdown feature when printing is complete. Since a print can take many hours or even longer, such a feature is indispensable in my opinion. However, the developers of Simplify3D used a framework that hides all runtime parameters from the operating system. External programs are therefore unable to access, for example, the current print status. That's why I developed Simplify3DAutoShutdown. The simple monitoring app only monitors the CPU load consumed by the Simplify3D process, which is caused by the printing process. After printing, this generally drops to a value close to „0“. If this is the case or falls below an adjustable value for a certain time, the tool executes a specific action, for example, the PC is put into sleep mode or performs a shutdown. Tip: Plug the 3D printer into a master-slave socket and it will also turn off when the PC is shut down by the Simplify3DAutoShutdown app. Use of this software is expressly at your own risk and was not originally intended for distribution or publication. Use the program wisely! For example, if you abort a print job, the app will evaluate the CPU usage fall through the Simplify3D process as a completed print job and start the countdown to perform the actions. However, Simplify3DAutoShutdown will automatically bring its program window to the foreground and alert you with two warning sounds during the countdown. 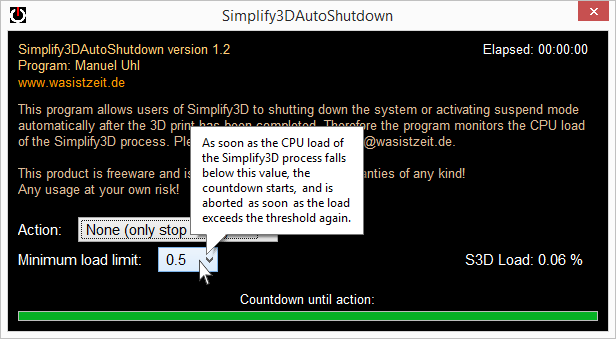 The countdown can then be aborted at any time by pressing the „Reset“ button under the „S3D-Load“ screen or by closing the Simplify3DAutoShutdown app. 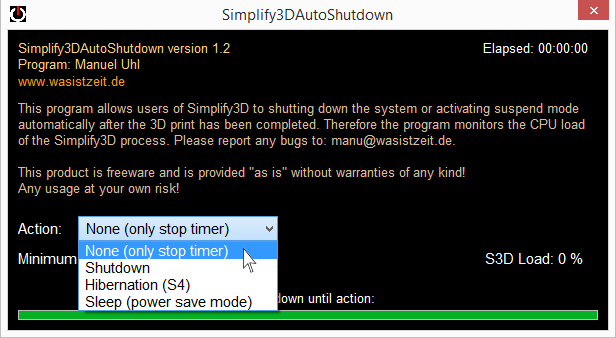 Closing Simplify3D will immediately close the Simplify3DAutoShutdown app. The value for the CPU load of the Simplify3D process displayed with „S3D-Load“ is calculated according to its own algorithm and does not necessarily correspond to the load value listed in the Windows Taskmanager. The selected action will be executed when the minimum CPU load set for the Simplify3D process is exceeded at least once (since app start or reset - so that no action is taken before printing has been started at all) and then falls below for a certain time (which should happen only when printing is finished). The upper right time indicates the elapsed time since the minimum CPU load was reached by the Simplify3D process until the minimum CPU load for the given time has passed. This time, after printing, should be approximately the same as the duration of printing (plus the amount of time it takes for the countdown to expire). „Simplify3DAutoShutdown“ is freeware. The app can be used for free without any limitations. Please tell me about your experience with different processor architectures, Windows- and Simplify3D versions. The program has been tested on Windows 7 and 8, on dualcore and quadcore processors from Intel and AMD with Simplify3D v3.0.